What do ducks say? 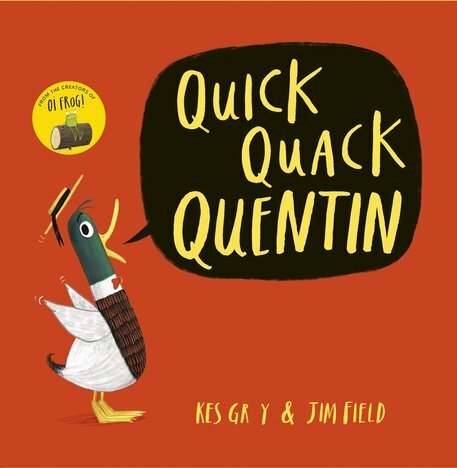 ‘Quack!’ But what does Quentin say? ‘QUCK!’ He has the quickest quack in the world, because his quack has lost its A. Do any of the other animals have one to spare? Not likely! APES don’t want to be PES. SNAKES don’t want to be SNKES. PANDAS don’t want to be PNDAS or PANDS. Will Quentin be stuck with a very quick QUCK?! A hysterical picture book from the superstar creators of Oi Frog!. Who knew learning about vowels could be such a laugh? Or do we mean lugh? By the Greenaway Medal nominated creators of Oi Frog! Winner of the Roald Dahl Funny Prize for Cats Ahoy, the Sainsbury’s Children’s Book Award for There’s a Lion in My Cornflakes, the Lollies for Oi, Dog and Oscar’s Book Prize for The Koala Who Could.